Sorby Sweets is a custom cake company that was founded in Fredericksburg, Virginia in 2014. In 2018 we relocated to Central North Carolina. We are unfortunately NOT accepting orders during this transition period. Whenever I'm "trying to be good" I find myself searching for low-carb dinner options. That's how this recipe came to be! Just the right mix of comforting Italian flavors and delicious vegetables. And, hey, if you want to #treatyoself a side of noodles is the perfect compliment to this dish! Preheat oven to 375 degrees. Prepare all vegetables by removing stems and gills from mushrooms, dicing the onion, pepper and zucchini. Arrange clean mushrooms in the bottom of a shallow pan. Brush with olive oil and season with salt and pepper. Bake for 30 minutes. Remove the mushrooms from the oven and drain any excess liquids. Spoon some of the sausage sauce onto each mushroom. I always keep a jar of spaghetti sauce on hand to add to the bottom of the pan as well. Sprinkle with grated parmesan. Return to the oven. Remove after 20 minutes to top with mozzarella cheeses. Bake until cheese has melted. Serve alongside a salad or your favorite noodles. Enjoy! Preheat oven to 375 degrees. Prepare all vegetables. 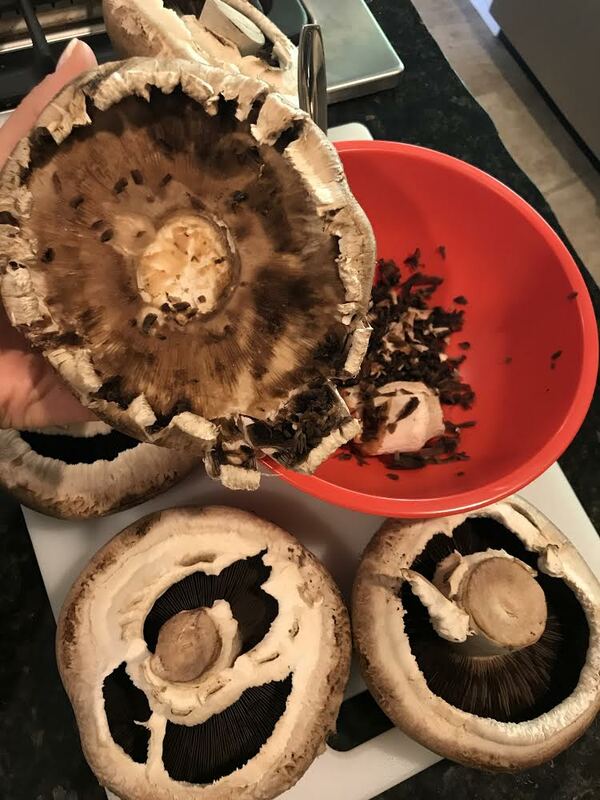 Remove stems and gills from mushrooms, dice onion, pepper and zucchini. Place cleaned mushrooms in a baking dish. Brush with olive oil and a sprinkle of salt and pepper. 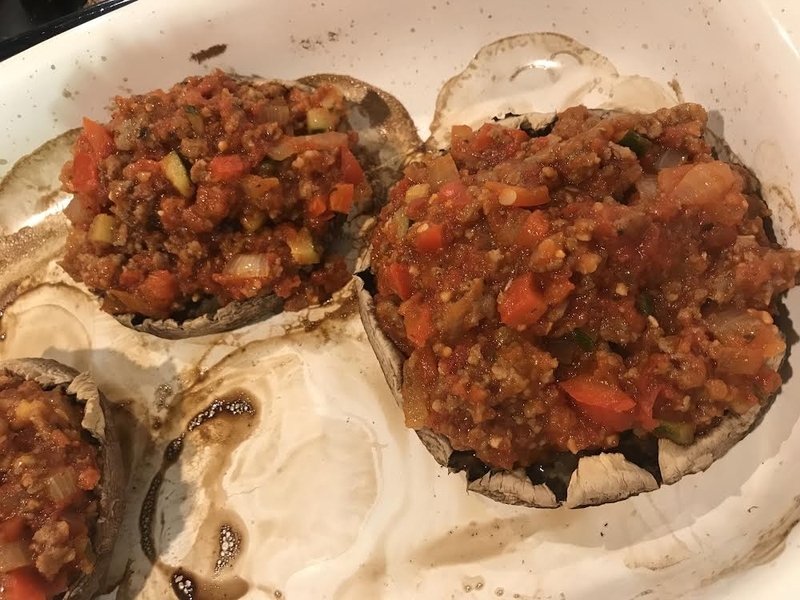 Bake for 30 Minutes or until mushrooms are tender. In a large saute' pan, heat 2T of olive oil over medium-high heat. Add diced vegetables and cook for 3-4 minutes. Add ground sausage and cook until brown. Drain excess liquid. Add garlic and seasonings and combine until fragrant. Add crushed tomatoes. Stir. For best results, continue simmering for at least 20 minutes. Remove mushrooms from oven. Drain any excess liquid. Spoon sausage mixture onto each mushroom and top with Parmesan cheese. Add spaghetti sauce to the bottom of the pan. Return to oven for 20 minutes. Top with mozzarella and bake until melted. Serve with a salad or your favorite noodles! This page is still currently under construction. Thank you for your patience!